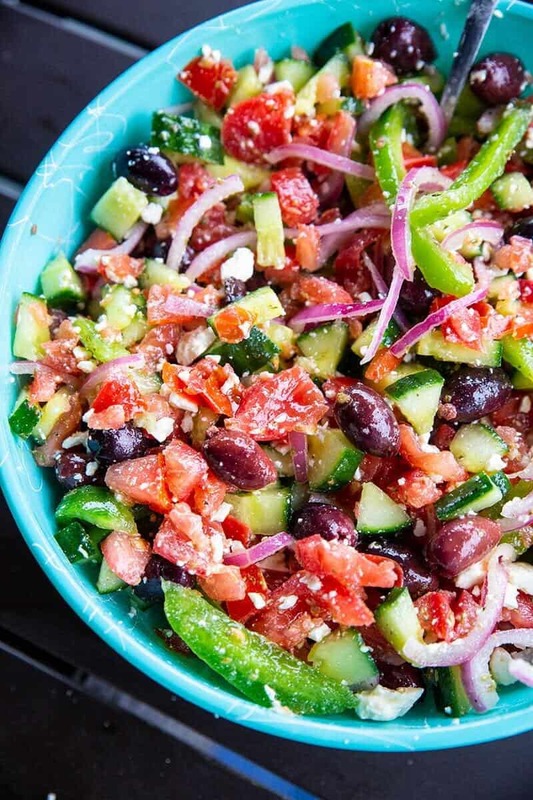 There is nothing like a classic Greek Salad with Homemade Greek Salad Dressing in the middle of the summer heat – or any time of year, for that matter. This salad is so easy to make that my kids whipped it up one evening for our supper! This is a great recipe to get kids in the kitchen and learning how to cook – or in this case, learning how to prepare a cold, healthy salad for supper! This Greek Salad was supper for everyone ( except the Rose of course who hasn’t yet accepted olives into her list of foods she’ll eat) but both kids made this while Mike and I sat outside and relaxed on the deck. So forgive the fact that the slices of vegetables aren’t perfect, or that the dressing might not have been perfectly mixed. The kids might have only fought 6-7 tines, dropped olives on the floor and generally made everything more hilarious, but they DID end up making the salad and it was great! 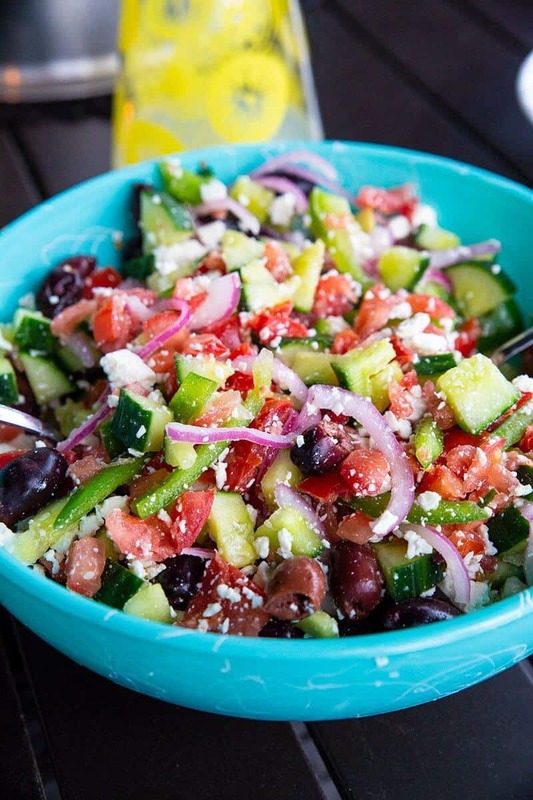 How do you make a real Greek Salad? Real Greek salad is far simpler than we make it here in America. An authentic Greek salad has a simpler dressing than I tend to make, it’s simply olive oil, oregano, salt and pepper. I have also seen the oregano left out. Like most Mediterranean foods that we make here in North America, we seem to make them over complicated than they really are. I could expand on that, but let’s settle for the fact that we tend to take recipes from the Old World and add all sorts of changes. Do you use lettuce in Greek Salad? That’s it! Now yes, I put green pepper in my Greek Salad, I like to mess with ingredients and that’s why I don’t call this an authentic Greek salad by any means. I add things here and there depending on what’s in season and more importantly, what’s in my fridge at the time! This is an excellent recipe to get kids started in the kitchen with their knife skills. 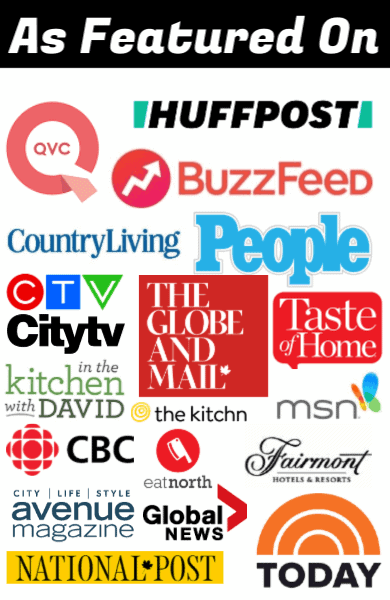 There is a lot of dicing, draining of the tomatoes, de-seeding a green pepper, the list goes on with the kitchen skills that can be learned from your kids making this recipe for you – important kitchen skills that this generation is sorely lacking. Yes, I sounded really “old-timer” there, but seriously, I was cooking by 12 and proficiently helping out for dinners at my house. With two working parents, dinner fell to the kids to help with, excepting my brother who managed to learn no cooking skills at all with two older sisters. 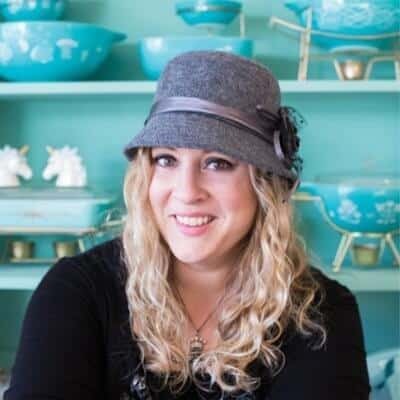 Don’t make the same mistake – ALL kids need to learn how to cook, boys included! There, that was my lecture for the day. Get the kids in the kitchen. 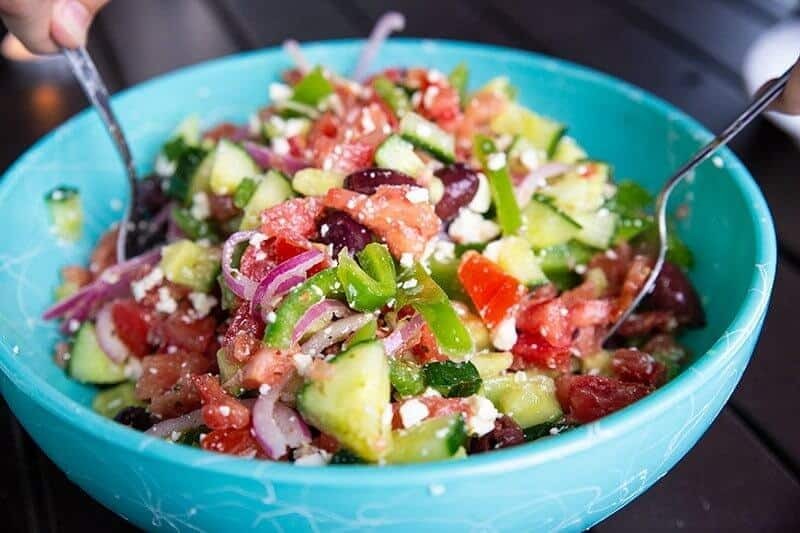 Now we eat this Greek Salad as a meal, like I had mentioned, but you can also serve this as a side dish. It’s a salad that is higher in calories, but oh those calories are packing a punch with their nutritional value. Have a piece of chicken breast with it for extra protein and call it dinner! If you want a carbolicious salad, try my Fast and Easy Greek Pasta Salad! PIN this recipe to your SALADS Board and Remember to FOLLOW ME ON PINTEREST! 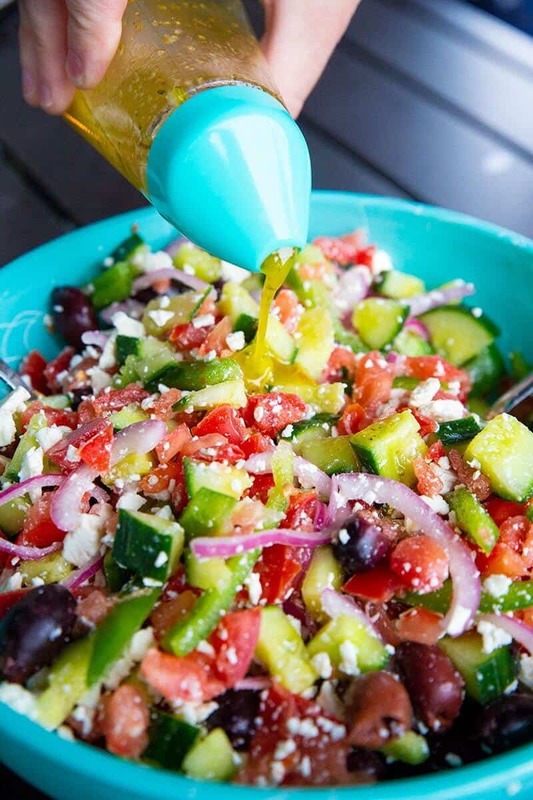 There is nothing like a classic Greek Salad with Homemade Greek Salad Dressing in the middle of the summer heat - or any time of year, for that matter. This salad is so easy to make that my kids whipped it up one evening for our supper! This is a great recipe to get kids in the kitchen and learning how to cook - or in this case, learning how to prepare a cold, healthy salad for supper! Place the thinly sliced red onion into the water and vinegar. Let soak for 20-30 minutes while you are prepping the other ingredients. Dice the tomatoes into small bite sized pieces, cleaning out the seeds. Place in a colander over your sink to drain, and if wanted sprinkle with a tsp of salt to draw out more moisture. Toss, then leave in the colander to drain while you prep the other vegetables. Wash then slice the English cucumber into 1 centimeter cubes ( think less than bite size.) Place in the bottom of a large salad bowl. Stir the tomatoes to get more moisture out. and leave them in the colander again. Wash then cut the top out of the green pepper. Take a knife and cut around the top stem like you carve a pumpkin, then pull the top off (again, like a pumpkin). Remove the seeds from the inside, then cut green pepper in half, then keep cutting into thin, long slices. Add into the salad bowl. In a lidded mason jar or similar jar that has a sealing lid, combine all of the Greek salad dressing ingredients. Shake to combine. Add the tomatoes, basil and the feta to the salad bowl. Pour the desired amount of dressing on top, then lightly mix the ingredients until everything is coated with the salad dressing. All nutritional information is an estimate and actual nutritional values will vary. Great recipe, had it for dinner! Thanks! The idea of cubing the cucumbers makes it so easy to eat!